Caption: A monarch caterpillar elongates in search of some real food. I've read in a couple forums that people have had success feeding 5th instar caterpillars a watermelon diet when milkweed was not available. I experimented over two summers placing some of my largest larvae atop the sweet pink fruit. What you see above is basically the result of every failed watermelon experiment. I find successful results of this questionable since I have only heard this reported from private individuals. My main question is, if the 5th instar caterpillars can use this for nourishment, then why can't the smaller caterpillars? It would be interesting to see a monarch research organization conduct a study to see if monarch larvae can replace their milkweed diets with other types of plants or food. I don't think I have ever seen a caterpillar with his "antennae" spread out like an eagle's wings. I'm assuming he was feeling out the surface of the plate. 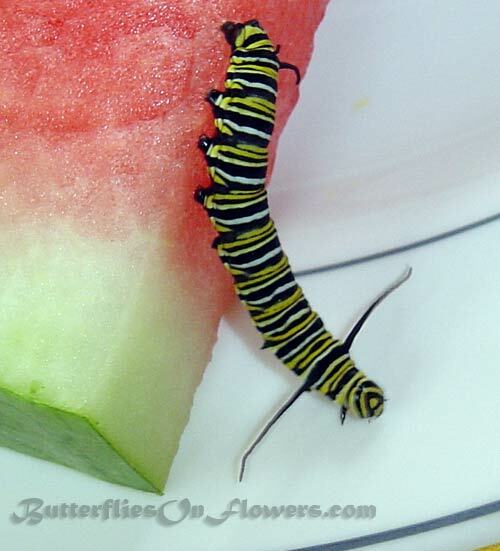 Caterpillar Facts: Monarch larva have brightly colored black, white, and yellow stripes. Many believe these bright colors serve as a warning to predators that they are toxic. If this is true, it's not a very effective defense since most of the caterpillars are eaten by ants and spiders.